I am thankful. My heart is full. It has been a beautiful week with my boys. If you’ve read any of my previous posts like this one ..... and this one .... and this one, you know I'm quick to confess how hard this parenting thing is and how often I get it wrong. But today, well, I really just want to celebrate God's grace because I have seen the fruit of grace in my boy’s lives this week and I am thankful. Last Friday I was sitting here thinking, “Wow, now that was a rough week!” And there were moments I wondered, “God, can grace really reach a child’s heart? I know your grace has changed my heart, and it’s changed our family as a whole, but can it *really* change a young child’s heart? Can I see the fruit of your grace NOW in their little lives?” Yes, it was that kind of week ~ it was enough to make me doubt. But how faithful He is, even in our questioning and doubt, to reveal His glory and His power. This week Jesus reminded me that indeed it can ~ grace can change a child’s heart. We all crave unconditional love. Our souls were designed to crave the heart transforming, life changing grace that Jesus purchased for us on the cross. I listened to my boys telling their friend all about how Jesus loves us so much He died on the cross and rose again to pay for our sins. When Brennan’s temper flared this week, instead of losing my temper too, grace enabled me to hug him tightly and whisper in his ear, “Oh how I love you, oh Brennan I just love you.” When Cal failed to listen and obey in a thoughtful and respectful way, rather than get frustrated and feel personally offended, it was grace that allowed me to kneel down, look in my sweet son’s eyes and gently lead him in obedience and respect. I’m not saying it was a perfect week- it never is. It was just a week where we went to the throne of grace together and we were changed. And I’m not saying any of this happened because of the kind of mom I was ~ No, it happened only because of the God we serve- a good and kind and faithful and powerful One. Surrendering to grace is not easy, especially in parenting. My nature tells me that giving my kids more law will make them become more like the person I want them to be. But the gospel tells me that giving my kids more grace is the only way their hearts will be transformed and a desire to love what Jesus loves and do what Jesus would do will transpire. The law provides no enablement to resist the power of sin; it only condemns the sinner. But grace, sweet grace, enables. (Romans 6:14) Grace, not law, produces fruit. And I was blessed to experience that this week with my boys. It was a precious reminder indeed that grace really can melt a child’s heart, just as it melts mine. 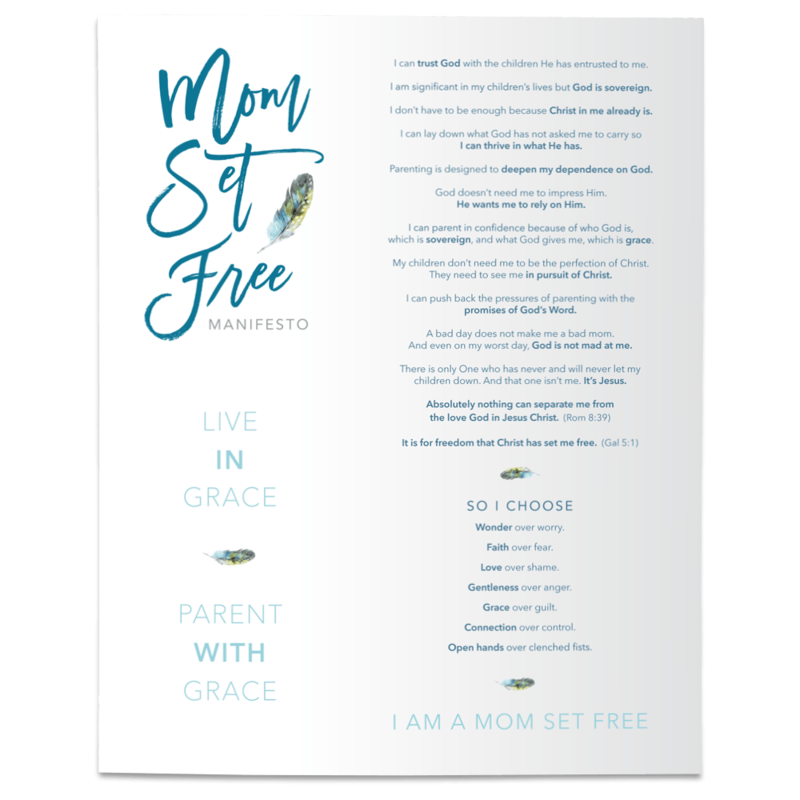 I'm excited to continue this conversation in the next several posts where we will be looking more closely at how we can surrender to grace in our parenting. And if you'd like to receive an email notification when I post new blogs, please click here to subscribe.